Yesterday we had a measurement flight going over India to the Bay of Bengal region. The whole flight procedure was according to schedule (i.e. the take-off was planned for 1 pm and also actually happened at 1 pm). It was a successful flight and the data look promising. 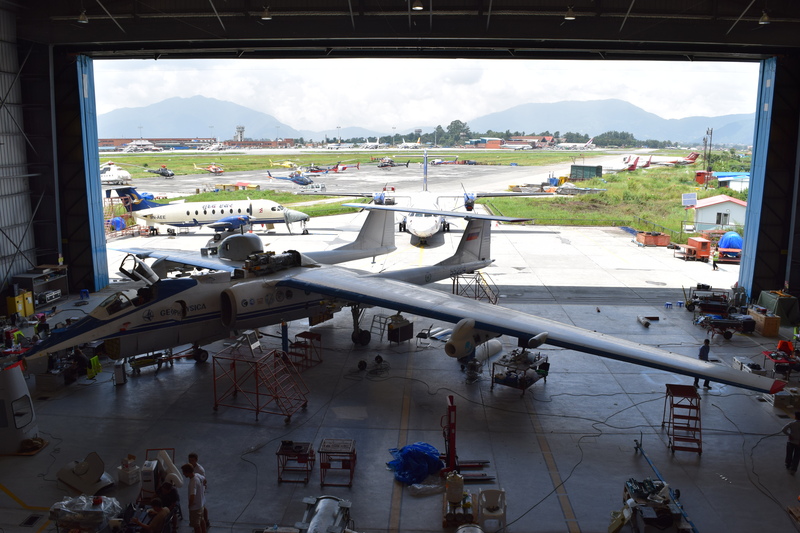 It is a fairly calm day today and the preparations on the instruments for the next flight have started. An engine inspection at the aircraft was done during the last night so that the next measurement flight can happen tomorrow either in the morning or afternoon (which is still point of discussion). It seems that the last possible flight day is the 10th of August. At the moment 6 out of the planned 9 measurement flights took place. Hence, in order to have 9 flights at the end of this campaign, we have to fly Tuesday, Wednesday and Thursday, so three days in a row. This gives the scientists little time to download the data and prepare their instruments in between flights. 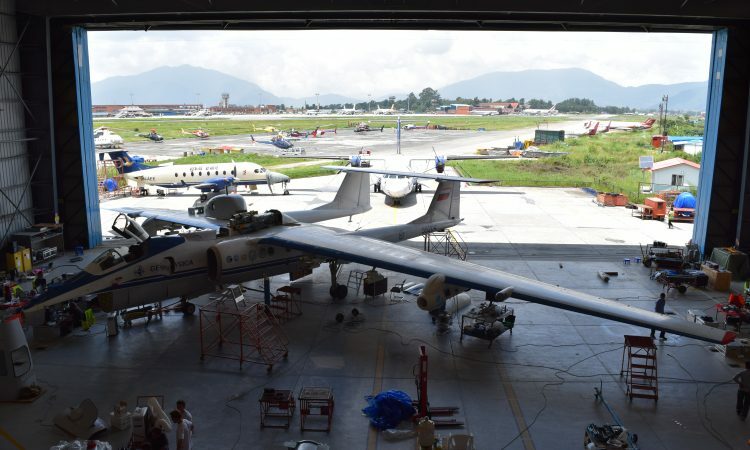 Every day a flight planning group sits together and discusses the current and forecast meteorological situation in and around Nepal (in the Asian monsoon region). The position and development of the Asian monsoon anticyclone, incoming typhoons, temperature at different heights and enhancement of different substances are looked at. Additionally, the planned flight track is determined by the flight clearances. We don’t have any flight permission to go over Tibet and have to apply for flight permission over India and Bangladesh each time prior to flight. This limits the flight track for some flights only to Nepal. However, prior to the campaign some possible, preliminary scientific flights have been planned (that include flight tracks over India to the Bay of Bengal) and flight clearances for those flight tracks were requested for random days (each flight clearance is permitted for three days) during the campaign. The Geophysica tank enables a flight duration of usually around 4 hours, which limits the area that can be reached. All those components determine which route is chosen for a scientific flight. Listening to the flight planning team is very interesting. As an example I added the following picture from yesterday’s flight planning meeting for a flight planned for Sunday (August 6th ). The purple and especially white areas on the picture present regions with a very fast transport of air masses from the ground to around 16.5 km height. This fast transport happens in the Asian monsoon, but also and even faster in occurring typhoons. The white area on the picture shows the air approaching Bangladesh from a typhoon near Japan and its predicted development for Sunday. The flight track that is planned is indicated with red dots and connecting blue lines, from Kathmandu to India and Bangladesh close to the typhoon air. This means that during this flight we could be able to measure the strong convection in the Asian monsoon but also the influence of the typhoon coming in. This picture originates from the flight planning tool MSS (http://mss.rtfd.io/) showing CLaMS data. UTC time at 16.5 km altitude. (picture by Felix Ploeger). Yesterday, the fourth flight of this campaign took place and the next one is planned for tomorrow (Friday) in the morning. Both those flights are restricted over Nepal. 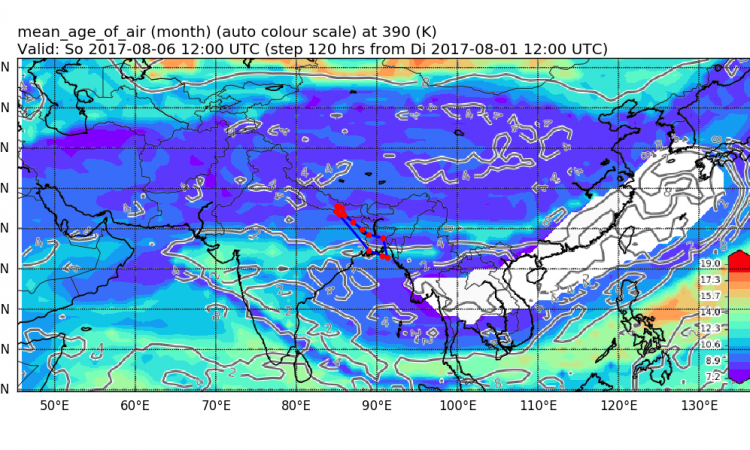 In Nepal we are currently pretty much in the center of the Asian monsoon anticyclone and can therefore probe the anticyclone well. Besides investigation the inside of the Asian monsoon anticyclone, the edge and outflow region are also of high interest during this campaign, however until now the edge has not been reached with the aircraft. Yesterday after the flight we took a group picture of everyone in the StratoClim community, who is here.